Reginald Holloway filed two discrimination complaints with the city, to no avail. Photo by Joed Viera. The red brick apartment building on Crescent Avenue is two blocks from Delaware Park. Online listings show pictures of light-filled rooms with hardwood floors and decorative fireplaces. Reginald Holloway never got to see inside. 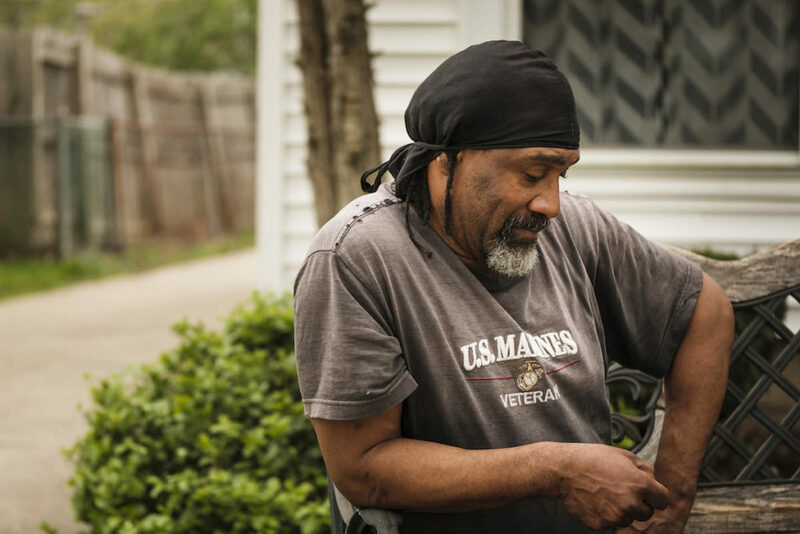 In 2008, Holloway, a disabled Marine Corps veteran, was looking for a one-bedroom apartment in a peaceful neighborhood. He still struggled with flashbacks and nightmares from his military service and wanted to live somewhere quiet; doctors at the Department of Veterans Affairs had diagnosed him with chronic post traumatic stress disorder. Holloway had a Section 8 voucher that would help him pay the rent and, in Buffalo, that shouldn’t have been an obstacle. In 2006, the city passed a fair housing law intended to protect people like him by prohibiting discrimination based on someone’s “lawful source of income.” The city, however, has done little to enforce the law – and few cases illustrate the failure to act on fair housing complaints as starkly as Holloway’s. After weeks of searching, and maybe a dozen rejections because of his Section 8 voucher, he found an ad that looked promising. An apartment was available in the building on Crescent Avenue, a leafy street of colorful houses in North Buffalo. But, the rental agent told him, the building did not take Section 8. “There was never any question that I could afford the rent,” Holloway said. He would pay roughly 30 percent of his monthly income towards the rent and the voucher would cover the rest. The landlord would receive the subsidized portion of the rent directly from the Section 8 agency each month. “If you’re on Section 8, they’re going to get their rent,” he said. Holloway eventually filed a complaint against the rental agent and the building’s owner. Undercover testing by Housing Opportunities Made Equal, a local fair housing organization, revealed a pattern of discrimination: a tester posing as a Section 8 recipient was “immediately told” she would not be able to rent the apartment once she mentioned her voucher. Apartments do have to pass a safety inspection before Section 8 tenants can move in, but, under the city’s law, this doesn’t justify a blanket refusal to rent to them. TDS Properties did not respond to requests for comment. In 2011, two years after he filed the complaint, Holloway finally received a response. The city’s fair housing officer, after taking four times longer to investigate than the law allows, agreed he had been discriminated against. Far from a resolution, this was yet another obstacle. The determination was dated September 2010, but Holloway didn’t receive it until nine months later. Someone had apparently forgotten to send it out. And, despite finding that TDS had discriminated against Holloway, the city declined to take any further action on the case, records show. In February 2012, Holloway saw another ad for the same building and called again. Once again, he was told that the building did not take Section 8, according to a second complaint he filed. At first, company president Phyllis Siskar wrote to the city’s fair housing officer, denying the allegations. But, a few days later, she wrote again, providing the exact response the company had given to Holloway’s first complaint, three years earlier. The second complaint wasn’t re-tested, but the fair housing officer came to the same conclusion, again agreeing that TDS Properties had discriminated against Holloway, and referring the case to the Corporation Counsel’s office, under the process outlined in the law. For three years, the second complaint languished. But the city’s attorneys had never asked Holloway about damages, said Grace Andriette, Holloway’s lawyer at Neighborhood Legal Services. If they had, Holloway said, he would have told them how the experience had worsened his anxiety and left him alternately furious and despondent, how finding somewhere that would accept his voucher took so long that he worried he would run out of time and lose it. To Andriette, the city’s response contained an inherent contradiction. It’s an established principle of fair housing law that loss of rights is a damage, in and of itself. And the city’s delays took their own toll. “They ran me round for seven years,” Holloway said. The city’s reluctance to act, even in cases like Holloway’s, where a landlord is found to have violated the law, gives housing providers little incentive to comply with the law and victims of discrimination little reason to report it, advocates say. Investigative Post reported Thursday that the city’s process for handling discrimination complaints is plagued by delays, bureaucratic mistakes that leave some cases unresolved for years, and a startling lack of enforcement. In the 12 years since the law passed, city officials have taken legal action to enforce the law only once, despite receiving at least 25 complaints. A few years ago, Holloway said, while he was waiting to hear about his second complaint, he saw Mayor Byron Brown at a summer concert and asked him about the delay. The mayor, he remembered, was polite but non-committal. Charlotte Keith is a reporter for Investigative Post, a nonprofit investigative journalism center focused on issues of importance to Buffalo and Western New York.